Version 1.1 includes (as example for other themes) a new feature : clonable sidebar ! 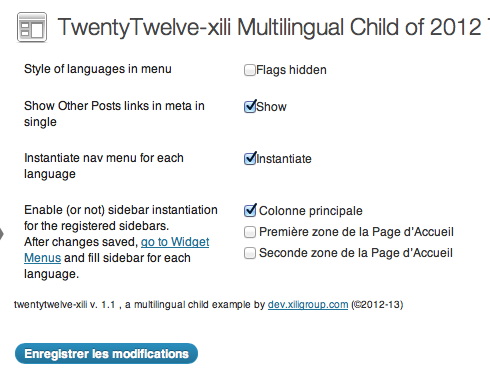 It is now possible to have a sidebar of each wanted target language. It can be very interesting if, according content strategy, the content (series of widget) are different in each language. For developer as example for your theme : you will see a function in functions.php to define in admin UI which sidebar must be cloned and some new lines in sidebar.php and sidebar-front.php in the child theme. Version 1.1.2 improves search form. 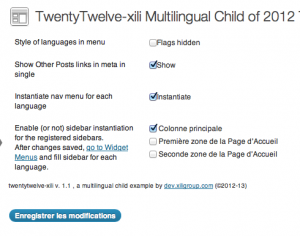 This entry was posted in News and tagged sidebar on January 31, 2013 by dev xiligroup.